Because of all of the thread scattered around about the 12v battery problems, I have decide to start a thread on what we have come up with for solutions. I personal am doing a lot of testing with a data logger and will be putting the info and results here for all to see. 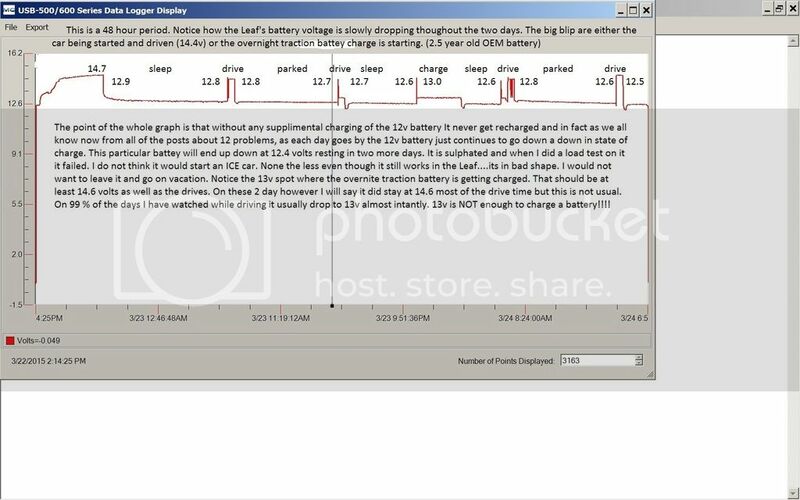 I have graphed the Leafs 12 volt battery behavior over time as well as 3 different charges that I use. I will start with the demonstrating how the 12v battery is always in a continual state of being slowly discharged. RegGuheert's Posts have been very valuable and I will start with his demonstration and add my own as to this problem. 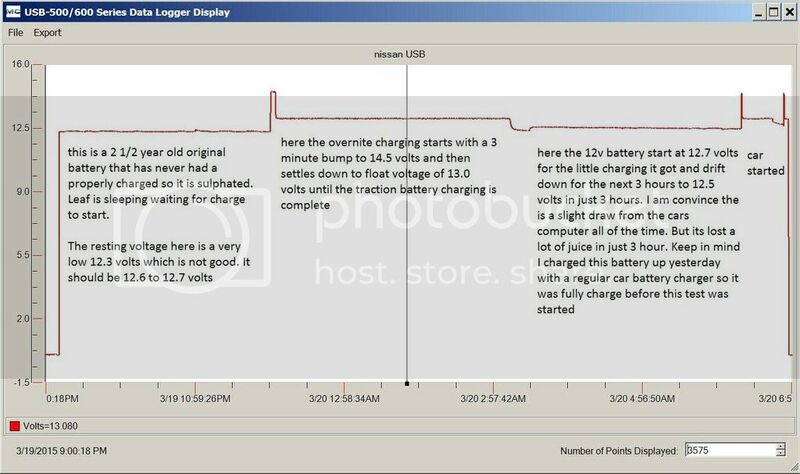 Later I will add my graphs of how the Battery Tender Junior works as well as the Battery Tender Plus and the CTEK 7002. I will also put my choice of replacement battery and why I chose it. Here we go. And Finally here below is a 48 hour shot starting with a one time Battery Tender charge on Sunday nite followed by 2 days of normal use. 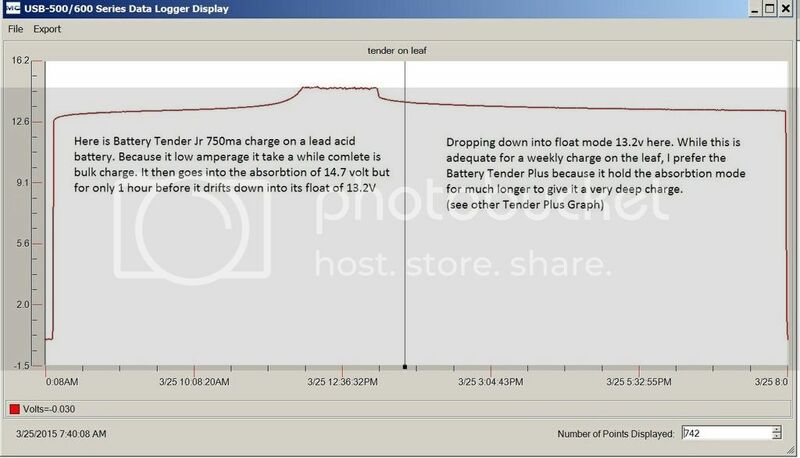 Here is a comparison of the algorithm for the Battery Tender Jr (750ma) and the Battery Tender Plus (1.5amp). The Tender Jr is super for keeping a float charge on batteries. I use them on all of my mowers, 4 wheelers and motorcycles. 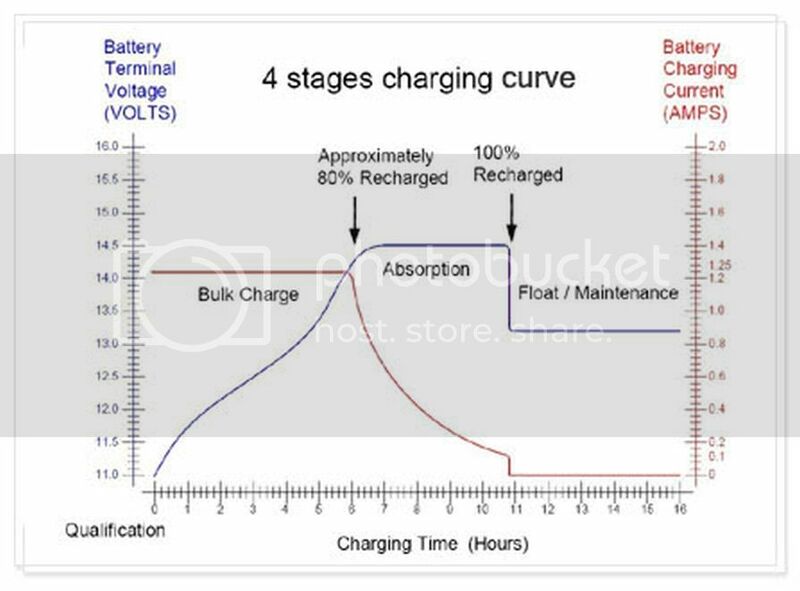 However I personally think its absorption phase is a little to short for giving a battery a nice deep charge. Now if you used a regular charger on the battery first and then used Tender Jr for keeping it charged that will do. Or if you used it on the Leaf every day it would probably be fine. For around the same money you can get the Battery Tender PLUS which is 1.5 amp and has a much longer absorption time. Not only that but it is temperature compensated so when the battery is cold it will give it the extra voltage it needs. For a once a week leaf recharge (which is what I prefer to do) this is my first choice. Also if you decide on an AGM battery in the future it was actually designed to handle the AGM batteries need for a longer absorption time. 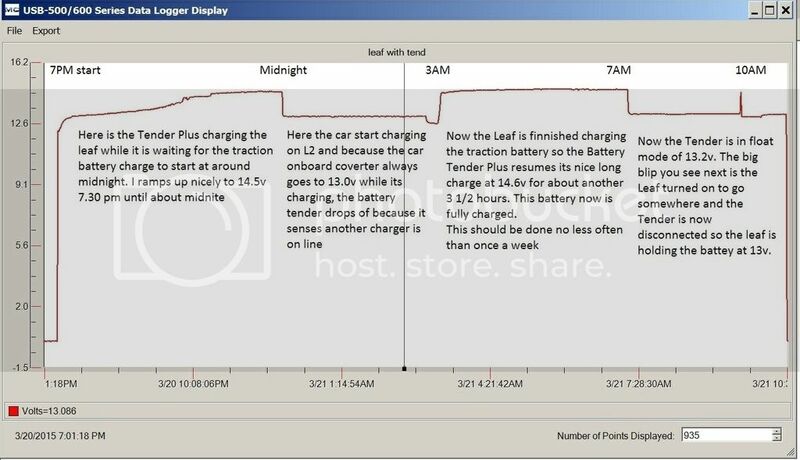 Here is a view of the Leaf plugged in for the nite waiting for an L2 charge which will begin around mid-nite. The Battery Tender Plus is also plugged in and turned on. As you can see the 2 charging sources work fine together. Interesting results. I also really like the Battery Tender chargers. I have both as well as the larger 5 amp version. I assume the tender you have is one of the newer ones, I think they changed them again last year, I know they look slightly different as well. 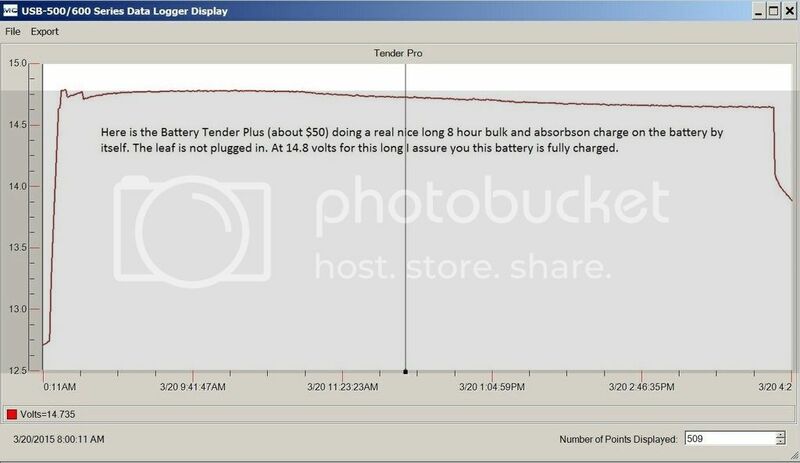 I didn't realize the tender didn't bulk as long, I will switch back to the Plus to charge the leaf. What makes you think any of the cells are sulphated? At what temperature are the batteries when you're logging the data? Are you reporting open-circuit voltages or is the battery connected to the car? yes this was open circuit and the specific gravity was checked with an MISCO 7064VP Refractometer. There is no question about the condition of this battery. Battery was a 72 degrees but drifted down to about 60 by the end of the day in the road tests. My Snap-on Load bank shows a fail. The leaf simply does not keep its 12v battery charged. 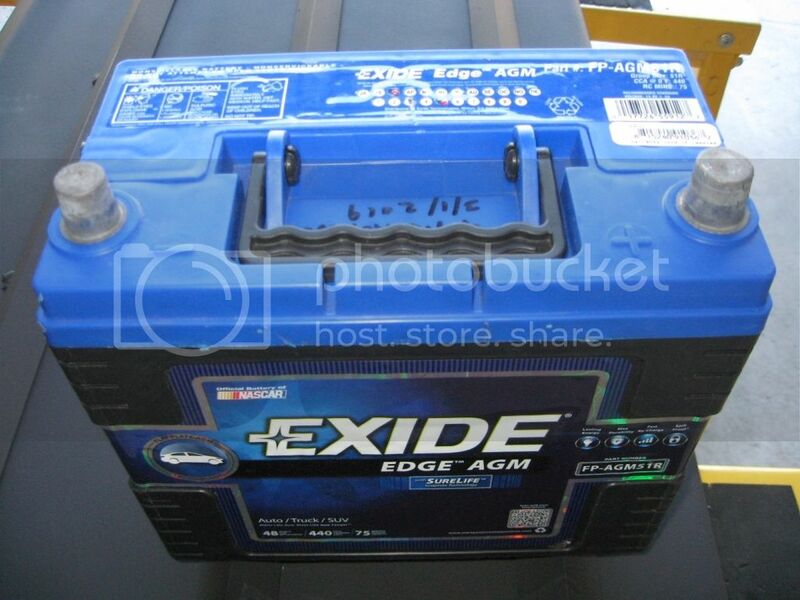 I will be putting in an Exide Edge AGM next weekend and repeat the test. 69800 wrote: yes this was open circuit and the specific gravity was checked with an MISCO 7064VP Refractometer. There is no question about the condition of this battery. Battery was a 72 degrees but drifted down to about 60 by the end of the day in the road tests. My Snap-on Load bank shows a fail. Thanks for the add'l info. Sounds like you've got a battery on the way out. 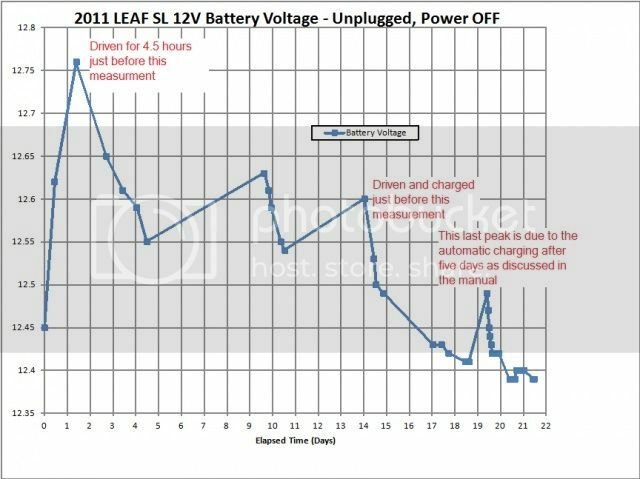 69800 wrote: The leaf simply does not keep its 12v battery charged. ..."the" Leaf, "that" Leaf, a "select few" Leafs, or "all" Leafs? 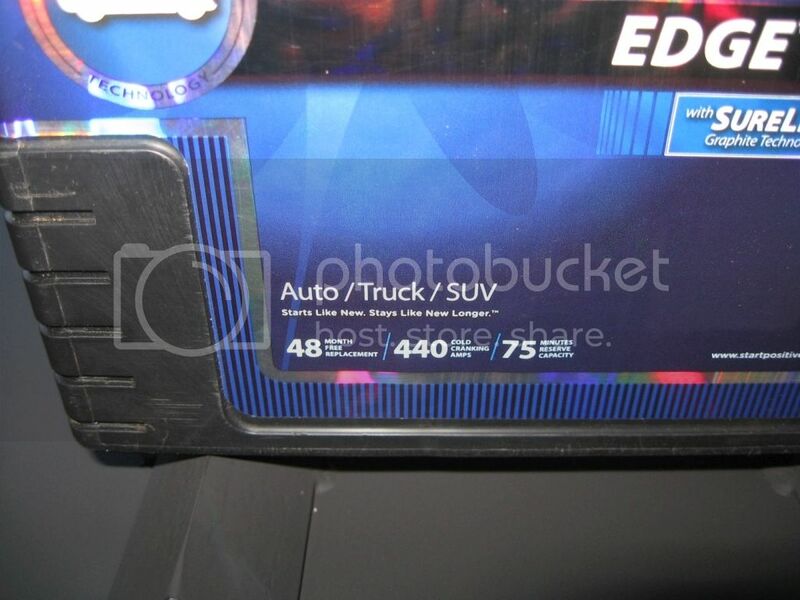 I think it might just be the 2011 2012 models. If you read all of the 12v posts seems most people are seeing low voltage from the converters. They put out a 14.5 charge for just a little while then drop to float voltage of 13.0 and stay there. I decided to use and AGM battery due to the fact the plates cannot sulphate due to the design. Plus with lower resistance the battery charge much faster being able to better take advantage of the short charge cycle the converter provides. 4 year full replacement warranty. An AGM won't protect anyone from an insufficient charge. Sealed or not, lead will not give a long life if it's not completely charged. If Nissan won't swap the DC-DC to bring it up to spec, I'd replace the battery with LiFePO4 - it prefers to be kept a bit low.